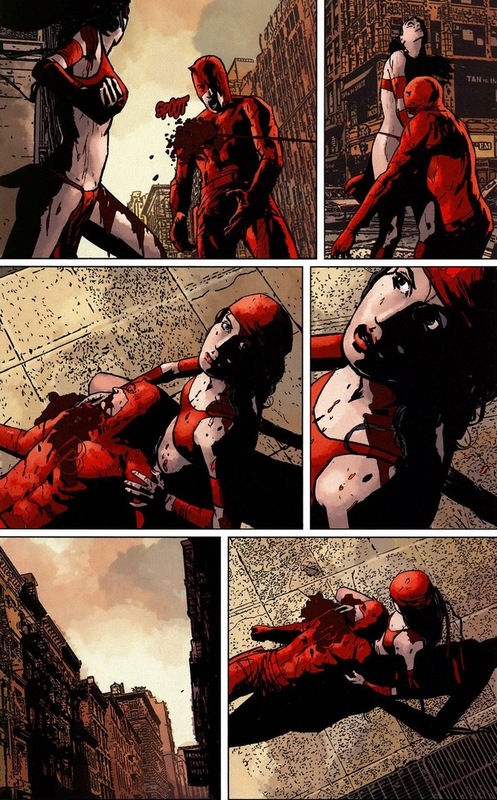 We jump to the tragic life of modern Daredevil, where his only victories came in not having his entire life destroyed and everything he’s fought for become meaningless. These are dark days. 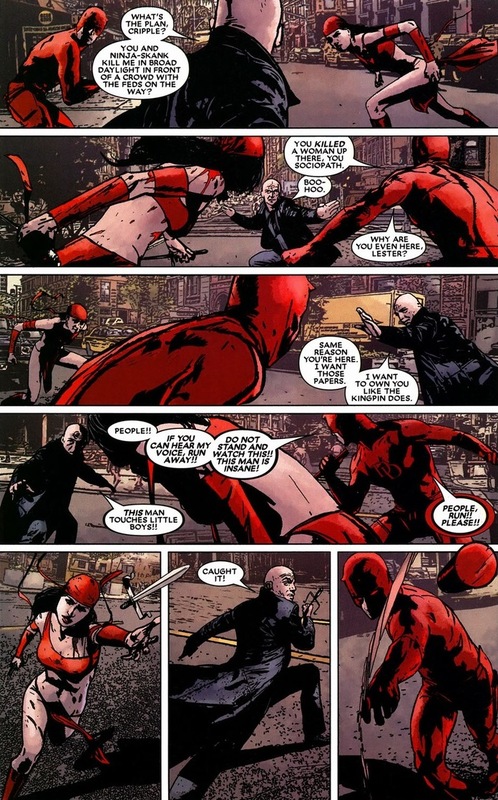 In the current story from Daredevil #79, written by Brian Michael Bendis and drawn by Alex Maleev, Daredevil’s secret identity is outed by a tabloid. That’s right – because if he must go through physical trauma such as stabbings, beatings, and the normal superhero punishment combined with the emotional trauma of watching loved ones die in front of him and his unhinged sanity of keeping the overwhelming chaos from consuming him, we should add mental trauma to that list. It creates the full trifecta of never-ending sadness. Then Kingpin comes forward admitting he has physical proof that Daredevil is actually Matt Murdock. Bullseye wants the documents. We pick up halfway through the issue and mid-fight. 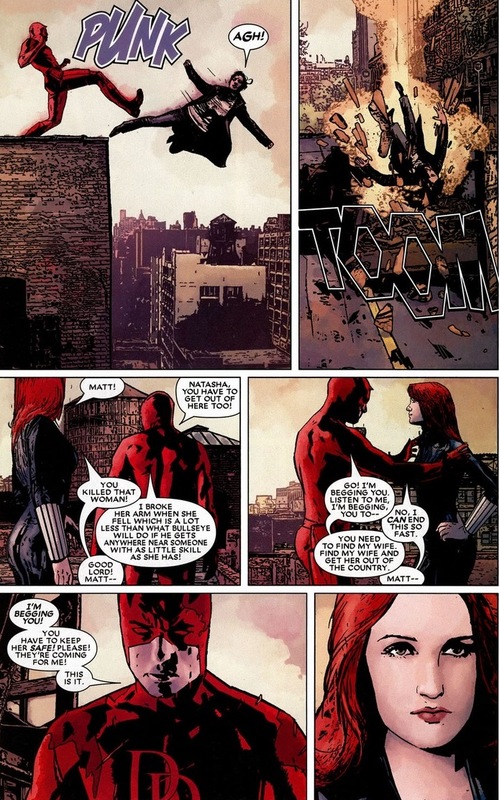 Oh yeah, and Daredevil is married. Long story made short: she’s a sweet civilian who like Murdock also happens to be blind. Common interests build strong relationships, you know. Luckily, and not just for vengeance purposes, Daredevil gets an ally this time – someone just as ninja-y as our protagonist. It’s Elektra, because let’s be fair, you already see her in the page below before your eyes wandered to this text. Note that this Daredevil isn’t playing any games today. He hasn’t experienced joy in fifty issues. 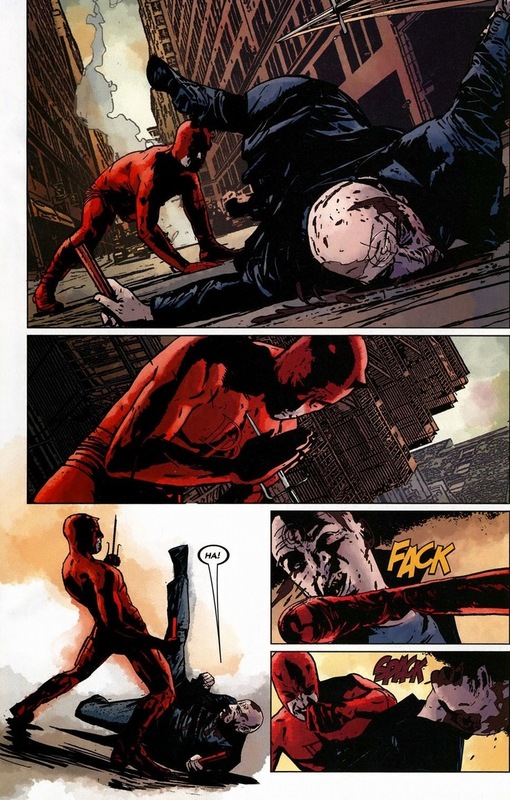 So when I offhandedly mention that Daredevil is tired of Bulleye’s crap, I’m underplaying just as much. Arch-nemesis must be more than scary, dangerous bad guys. No, the superhero must need the supervillain – some terrible psychological aspect of having the opposite qualities (whether that be physical or personality) placed inside another person. Or at the very least, what the supervillain represents. Like say, how Spider-Man and Green Goblin represent different paths genius can take. Iron Man and Mandarin bring us technology versus magic. Red Skull’s a Nazi. But Bullseye? Daredevil doesn’t need him. He doesn’t represent anything symbolic for our crimson hero. 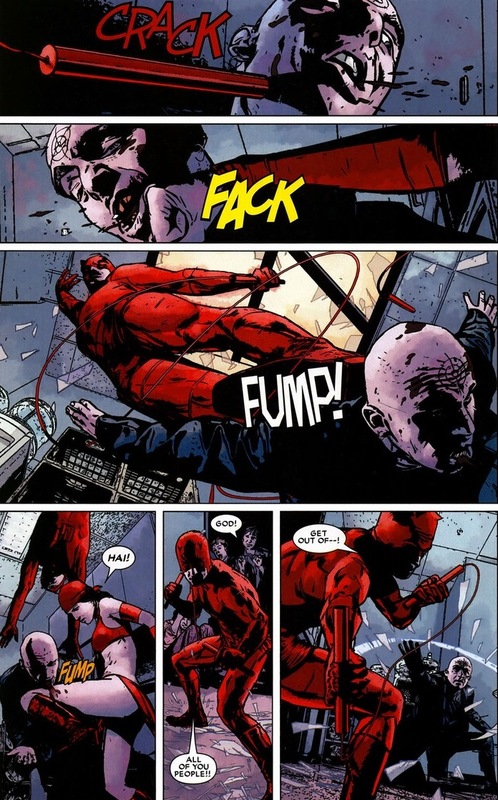 And unlike the complex give-and-take of many superheroes with their dear arch-nemeses, Daredevil only possesses one emotion towards Bullseye: pure, unbridled hatred. 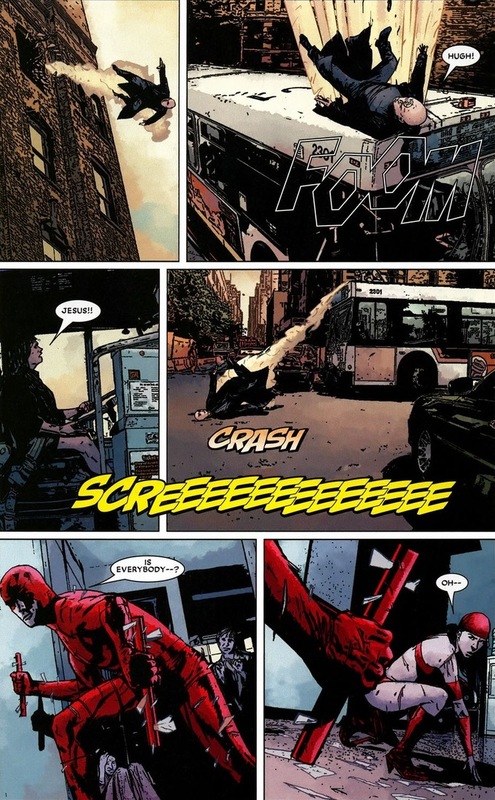 Bullseye exists solely to be a bug for Daredevil to step on every few months, albeit a giant bug with claws and a shell and razor-sharp antennas and projectile venom and anything else dangerous a bug could have. The fight isn’t over. Not for another five pages. To give a compliment where it’s due, Bullseye can take major punishment. We’re talking Punisher-level amounts of abuse and suffering. Now’s a good time to tell you that soon after this, as some sort of half-reward for being an awful person, Norman Osborn makes Bullseye an Avenger. He gets the penthouse suite, the ID card, and everything. People love and cheer for him. 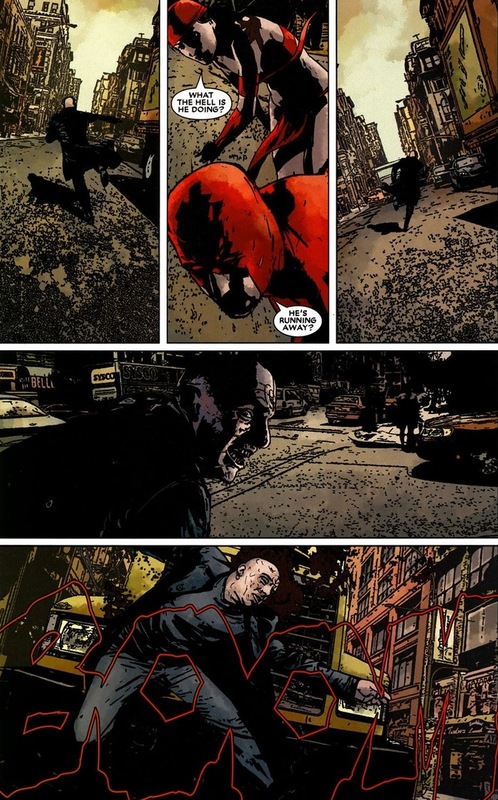 So as you watch the upcoming beatdown, know that Bullseye’s life is about to become awesome – he deserves far worse than what Daredevil and Elektra give him. Sometimes good things happen to bad people. Everything about this fight gets wrapped up in a delightfully visceral bow. But as satisfying as Bullseye’s conclusion is, remember what I said at the very beginning. 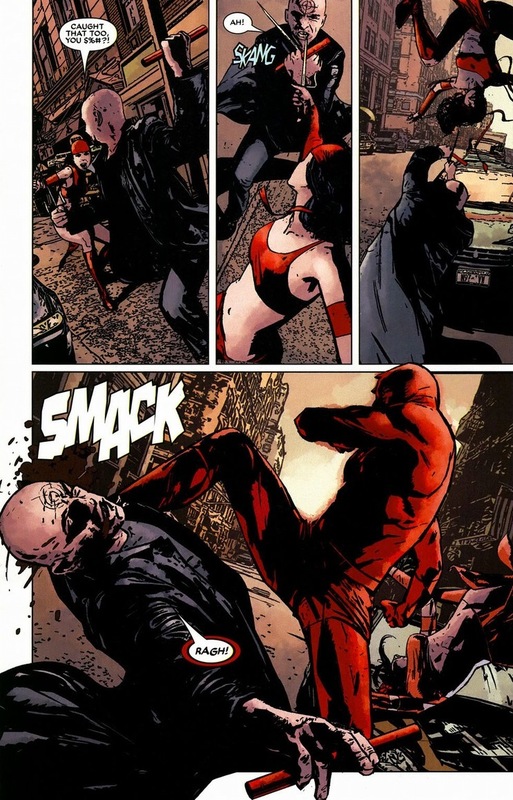 Daredevil can’t win. The poor guy has a span of about a hundred issues of constant torment far beyond what we non-powered wussies can endure. 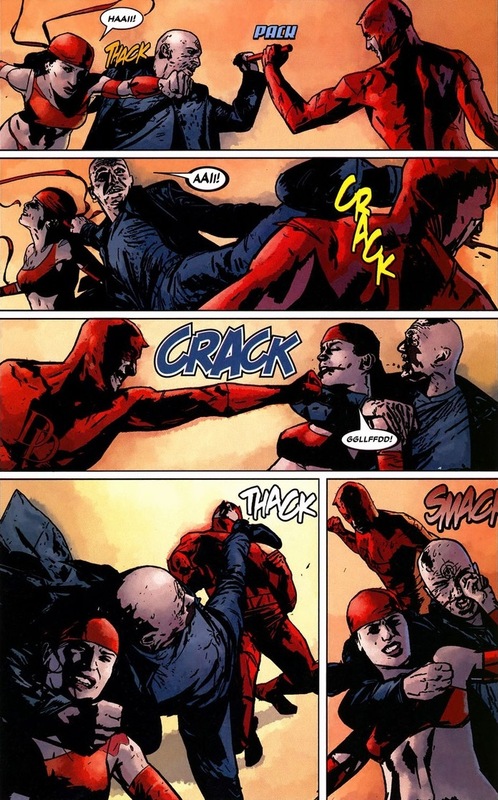 So when you see Bullseye lose so spectacularly, that only means Daredevil has to lose by that much more. One more to go! Shadowland is next!